A lazy start to the day and breakfast at the on site restaurant , The Beach Club, gets us on the road just before noon. We’re going right past the Costco so we swing in that way for gas and unbelievably more shopping. Gas is certainly a deal at almost 25 cents below the typical gas station. However, the Saturday traffic in the area is a zoo. This little stop costs us close to 1 hr in a traffic jam. Once free of congestion we roll over to Paia and check out a beach noted for boogie boarding and body surfing. The wind is strong and sand is blowing everywhere. This will likely be the starting point for the ride on Monday. As we head up towards the summit there is one particular turn that we’ve been warned not to miss, but sure enough I blow right through the turn but quickly realize the mistake and turn around. In the car this is no big deal, on the bike it adds up to an additional 1,700′ of climbing to a dead end. Sure enough the road is an unrelenting “up”. I note only 3 short flat sections. We see about 5 riders going up, two couples and a solo rider in a lime green jacket. I knew about the distance, the grade, the switchbacks, the narrow road in places, the 30°F temperature drop by the time you get to the top, but nobody mentioned the wind! It’s howling today and we have to brace ourselves just to walk around. At one point we spot mister lime green walking his ride. Initially I thought he was tired but later figured out that he was having trouble staying on the bike and on the road in an open section. 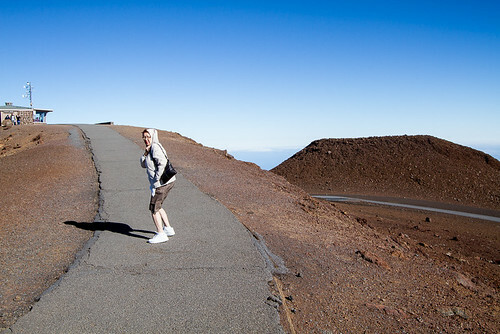 We later saw him successfully grinding his way up to the summit. I hope it’s less windy when I ride on Monday. 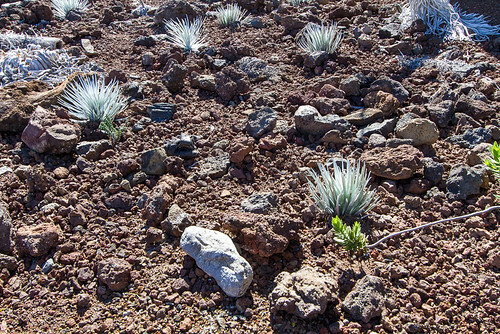 and then just volcanic rock. 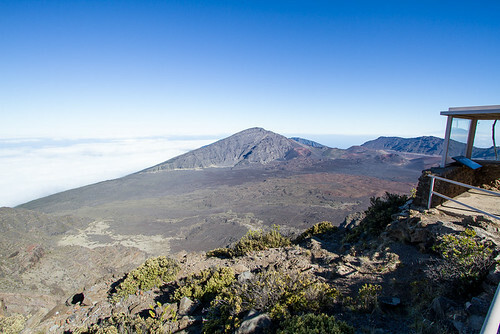 At Leleiwi, the first of two overlooks, we get our first glimpse of the crater. You have to hike a short distance on a trail and the wind is howling and the temperatures have dropped substantially from the 78F on the beach. Shirley returns to the car and I push on to get a look and take some pictures. I’m rewarded with a spectacular view of the crater and need to hide behind the shelter just to manage to hold steady enough to that the pictures. I intentionally increase the shutter speed just to compensate for getting buffeted around by the wind. 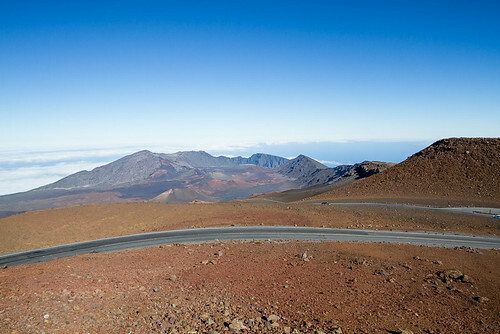 Back in the car we continue up to the summit at Puu Ulaula Overlook (also known as Red Hill). 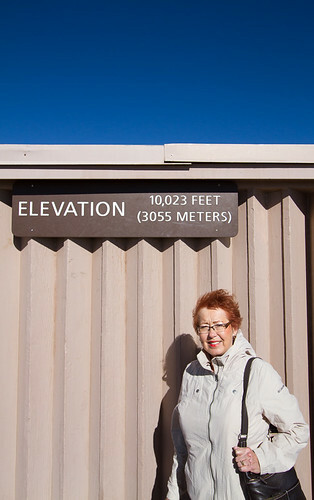 It’s a windy walk up to the shelter but really everybody gets their picture taken under the summit sign. 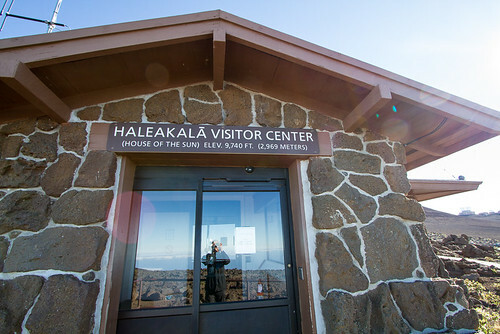 At the summit you are right next to the Haleakala Obsevatory also known as Science City. Because of the US Airfoce presence here we, not alowed to go over and explore that area. On the way down we stop at the Visitor Center, just below the summit. It’s already closed at 2pm, (they have really short hours) so we don’t get to see the exhibits, but take quick look around and of course some more photos of the crater. 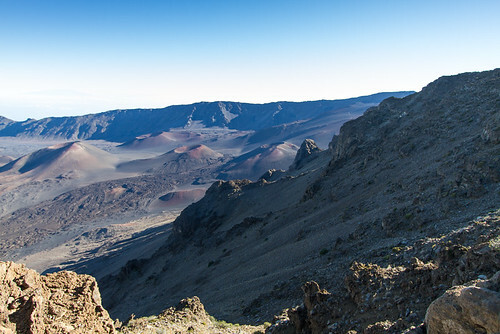 Further down the road we stop again, this time at the Kalahaku Overlook and get yet another spectacular look at the crater and surrounding areas from a different vantage point. We wind our way down the Crater Road and take a slightly different route back hoping over to Kula and then back over to Makawao where we stop to take a few pictures of this beautiful church we spotted earlier in the day. 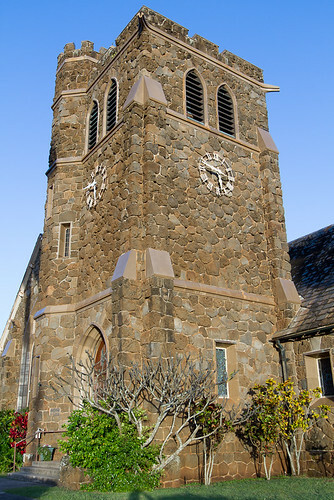 The Makawao Union Church was built in 1916 in memorial of Henry Perrine Baldwin and is on the National Register of Historic Places. Mr. Baldwin must have been quite the force back in the day, a lot of stuff is named after him. After checking out a couple of dinner options in Paia we decide to find a new guten-free restaurant over in Kihei which is about 45 minutes away. After picking up fish & chips we head back to the condo, another 45 minutes, and enjoy dinner and a movie. Lots exploring, lots of interesting stuff, lots of driving and we’re done for the day.